You’d think it would be easy to find good toddler slippers. Slippers that keep your toddler’s feet warm, cozy, and safe, while still being breathable. 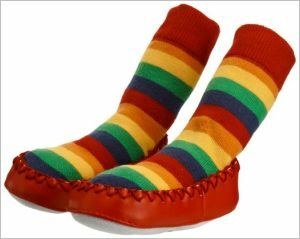 Slippers that stay on your toddler’s feet; not falling off when he’s running through the house, not being too temptingly easy to pull off and throw in a corner for the fun of it. Slippers for kids that don’t constrict the blood flow in your toddler’s feet or constrain them in any way, but let them grow and develop as they are meant to. Those are all basic criteria; there’s nothing fancy at all there. But slippers for tots that meet every single one of them are very, very hard to find. You could buy your toddler a dozen pairs of house slippers, and end up discovering that none of them are really wearable. Unless one of the dozen was a pair of MoccOns. Then you should be good to go, and don’t have to worry about the other eleven at all. 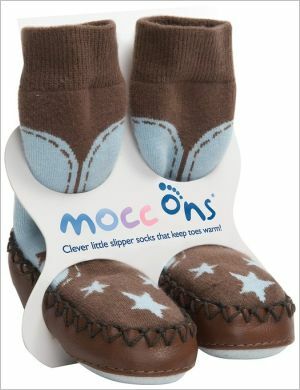 MoccOns are toddler slipper socks; slippers that are actually socks, with a sturdy real leather sole. The upper part is a stretchy, comfortable cotton sock that goes well up your toddler’s leg; the natural fibers mean that this sock is breathable and good for both warm and cool weather. The moccasin shaped soles are soft and comfortable, thick enough to provide protection even when your toddler runs up the graveled walkway, thin enough to be flexible. They are ever so slightly anti-skid, as well, so work well on hardwood floors when a toddler in socks would be constantly slipping and sliding. 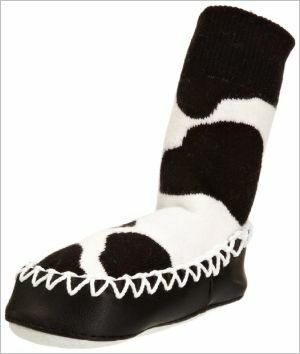 Or get a pair of Cowboy Boot sock slippers for your little cowboy or cowgirl. In light blue and chocolate brown colors, this shoe is perfect for both little boys and little girls, and is a fun ‘pretend shoe’ that you can just tell isn’t real because it’s too ridiculously comfortable. The make is the same: comfy cotton uppers, flexible leather soles. You can buy these for a child in the 12-18 month range, from 18-24 months, or in a larger size for 2 to 3 year olds. What are your favorite MoccOns, and why?